Clementine has been picked for Friend of the Week, which means she gets to be line leader, collect the milk money, and feed the fish. Even better, she'll get a Friend of the Week booklet in which all the other third grade kids will write why they like her. 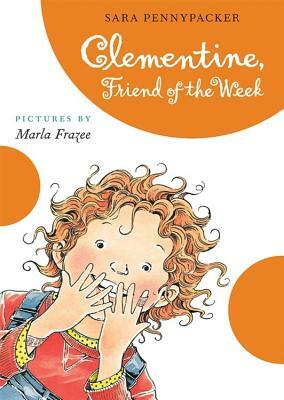 Clementine's best friend Margaret has all sorts of crazy ideas for how Clementine can prove to the class she is a friend. Clementine has to get a great booklet, so she does what Margaret says. What begins as one of the best weeks ever may turn out to be the worst. Who knew that being a friend could be so hard? Sara Pennypacker (www.sarapennypacker.com) is the author of three previous Clementine books and Sparrow Girl, illustrated by Yoko Tanaka. She divides her time between Cambridge and Cape Cod, Massachusetts. Marla Frazee (www.marlafrazee.com) has illustrated all of the Clementine books as well as many other popular titles. She was awarded a Caldecott Honor on two occasions, for All the World by Liz Garton Scanlon, and for A Couple of Boys Have the Best Week Ever, which she also wrote. She lives in Pasadena, California, where she works in a small backyard cabin under an avocado tree.